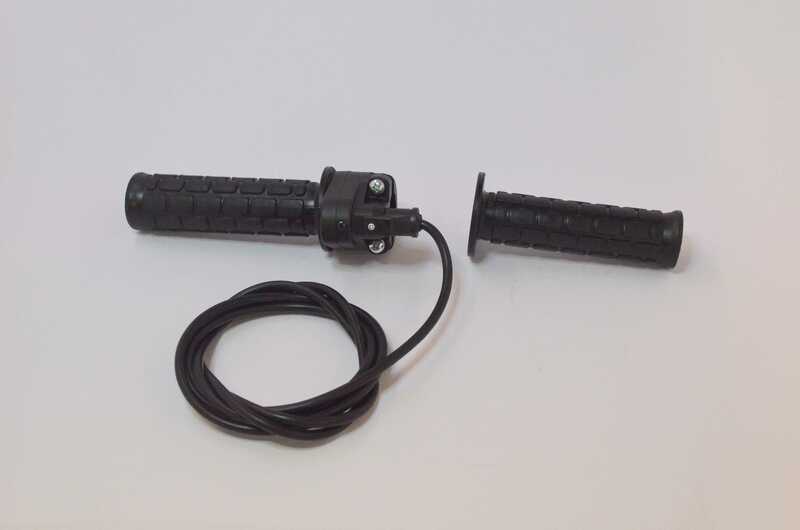 A twist grip throttle which is suitable for use with all 4QD controllers. Suitable for all controllers made by 4QD. 90° twist gives zero to full speed (0-100% of pot travel). Integral tube clamp for 22mm diameter tube. Cable supplied is 0.7m long, 3 core 16/0.2mm [please note this is too thick to reliably connect with the IDC connectors used on our controllers, so a CONI connector is recommended to join it to the 7/0.2mm required]. We can also supply the throttle with 1.0m CONI lead. See a drawing of GTH-203 with CONI lead or with RFK crimps when the shell is supplied unfitted to ease your assembly..
We can also supply a 1.0m CONI extension lead. Note the manufacturers of this throttle (Magura) make at least six other versions of it. This is the only version that is guaranteed to work with all our controllers. Wiring: for connecting the Magura to the Pro and DNO series controllers the following table gives the colour translation. We have an engineering drawing of the throttle here.